KING GEORGE, Va. — The widow of Army Sgt. 1st Class Scott Smith, whose partial remains were quietly dumped in a Virginia landfill along with hundreds of other service members, helped dedicate a memorial at the site in a ceremony Sunday. Between 2004 and 2008, the Air Force treated partial remains as medical waste and disposed of them in the landfill. Richard Lorey, an Army veteran who lives in King George, spearheaded the effort to erect a memorial here after the practice was made public. Lorey, with the help of the American Legion, raised money for the plaque and sought permission to place it at the landfill. Gari-Lynn Smith, the Army widow, for years sought to find out what became of her husband’s partial remains. He died July 17, 2006, in a bomb blast in Iraq, “the worst day of my life,” Smith said at the dedication. Believing the Air Force would treat his remains with dignity and respect was “one of my only comforts through his death,” said Smith, who visited the place where portions of his remains were thought to be dumped a day earlier. 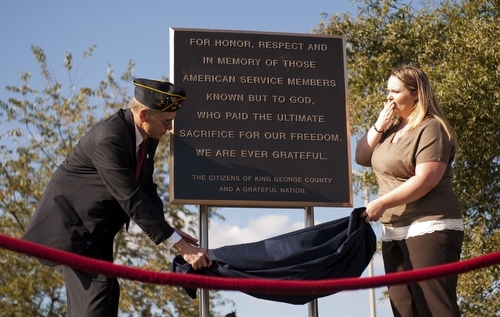 At the close of the ceremony, Lorey and Smith unveiled the plaque, which stands between an American flag and a Virginia flag at the entrance of the landfill.